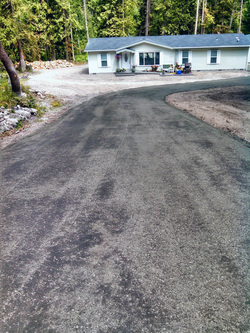 Services - EDEN EXCAVATING INC. Whether residential or commercial, we can provide complete site development. Our services include land clearing, demolition, foundation preparations, utility and septic installation, roads, driveways, drainage systems, dump truck services, debris removal, etc. The ability to provide all these services saves you time and money in the long run by cutting mobility costs and the scheduling of multiple contractors. This multifunctional ability lends a more cohesive vision to the end product. Licensed as a certified installer in Clallam County since 1991, we enjoy a respectful working relationship with the local designers and county officials. 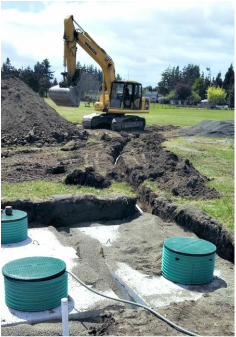 We have experience in installing various systems, and we are one of five contractors trained and licensed to install the specialty Glendon BioFilter systems in Clallam County. If a system is challenging to install, we are usually the ones contacted. Need power, water, sewer, water mains, etc.? We do it all and strive to minimize the impact on the surrounding terrain. Call us to discuss the needs of your particular project and receive a complimentary, competitive quote.